In what some scientists termed "a surprising, almost miraculous turnabout," radio telescopes, including major facilities of the National Science Foundation's National Radio Astronomy Observatory (NRAO), have provided data needed to measure the winds encountered by the Huygens spacecraft as it descended through the atmosphere of Saturn's moon Titan last month -- measurements feared lost because of a communication error between Huygens and its "mother ship" Cassini. A global network of radio telescopes, including the NRAO's Robert C. Byrd Green Bank Telescope (GBT) in West Virginia and eight of the ten antennas of the Very Long Baseline Array (VLBA), recorded the radio signal from Huygens during its descent on January 14. Measurements of the frequency shift caused by the craft's motion, called Doppler shift, are giving planetary scientists their first direct information about Titan's winds. "When we began working with our international partners on this project, we thought our telescopes would be adding to the wind data produced by the two spacecraft themselves. Now, with the ground-based telescopes providing the only information about Titan's winds, we are extremely proud that our facilities are making such a key contribution to our understanding of this fascinating planetary body," said Dr. Fred K.Y. Lo, Director of the National Radio Astronomy Observatory (NRAO). Early analysis of the radio-telescope data shows that Titan's wind flows from west to east, in the direction of the moon's rotation, at all altitudes. The highest wind speed, nearly 270 mph, was measured at an altitude of about 75 miles. Winds are weak near Titan's surface and increase in speed slowly up to an altitude of about 37 miles, where the spacecraft encountered highly-variable winds that scientists think indicate a region of vertical wind shear. The ground-based Doppler measurements were carried out and processed jointly by scientists from the NASA Jet Propulsion Laboratory (JPL, USA), and the Joint Institute for VLBI in Europe (JIVE, The Netherlands) working within an international Doppler Wind Experiment team. The GBT made the first detection of Huygens' radio signal during the descent, and gave flight controllers and scientists the first indication that the spacecraft's parachute had deployed and that it was "alive" after entering Titan's atmosphere. The radio-telescope measurements also indicated changes in Huygens' speed when it exchanged parachutes and when it landed on Titan's surface. The original plan for gauging Titan's winds called for measuring the Doppler shift in the probe's signal frequency both by Cassini and by ground-based radio telescopes in the U.S., Australia, Japan and China. Cassini was best positioned to gain information on the east-west component of the winds, and the ground-based telescopes were positioned to help learn about the north-south wind component. Unfortunately, the communications error lost all the wind data from Cassini. "I've never felt such exhilarating highs and dispiriting lows than those experienced when we first detected the signal from the GBT, indicating 'all's well,' and then discovering that we had no signal at the operations center, indicating 'all's lost.' The truth, as we have now determined, lies somewhat closer to the former than the latter." said Michael Bird of the University of Bonn. In addition to measuring the motion-generated frequency shift of Huygens' radio signal, radio telescopes also were used to make extremely precise measurements of the probe's position (to within three-quarters of a mile, or one kilometer) during its descent. 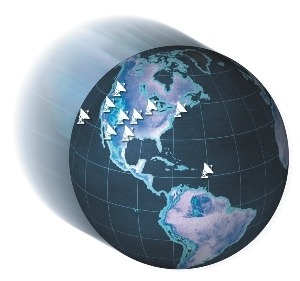 This experiment used the VLBA antennas, along with others employing the technique of Very Long Baseline Interferometry (VLBI). Combination of the Doppler and VLBI data will eventually provide a three-dimensional record of motion for the Huygens Probe during its mission at Titan. Huygens was built by the European Space Agency. 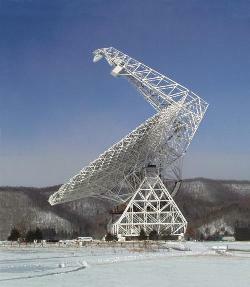 The radio astronomy support of the Huygens mission is coordinated by JIVE and JPL and involves the National Radio Astronomy Observatory (Green Bank, WV and Socorro, NM), the Netherlands Foundation for Research in Astronomy (ASTRON, The Netherlands), the University of Bonn (Germany), Helsinki University of Technology (Espoo, Finland), the MERLIN National Facility (Jodrell Bank, UK), the Onsala Space Observatory (Sweden), the NASA Jet Propulsion Laboratory (Pasadena, CA), the CSIRO Australia Telescope National Facility (ATNF, Sydney, Australia), the University of Tasmania (Hobart, Australia), the National Astronomical Observatories of China, the Shanghai Astronomical Observatory (Shanghai and Urumqi, China) and the National Institute of Information and Communications Technologies (Kashima Space Research Center, Japan). The Joint Institute for VLBI in Europe is hosted by ASTRON and funded by the national research councils, national facilities and institutes of The Netherlands (NOW), the United Kingdom (PPARC), Italy (CNR), Sweden (Onsala Space Observatory, National Facility), Spain (IGN) and Germany (MPIfR). The Australia Telescope is funded by the Commonwealth of Australia for operation as a National Facility managed by CSIRO. The Cassini-Huygens mission is a cooperation between NASA, ESA and ASI, the Italian space agency. The Jet Propulsion Laboratory (JPL), a division of the California Institute of Technology in Pasadena, is managing the mission for NASA's Office of Space Science, Washington DC. JPL designed, developed and assembled the Cassini orbiter while ESA operated the Huygens atmospheric probe.